Wedding PR: How He Asked, Honeybook, and more! Wedding PR: How He Asked, Modern Jewish Wedding, Honeybook and more! There’s no better way to wrap up our month than with some great client press features, including How He Asked, Modern Jewish Wedding, Honeybook and more. See them all below! 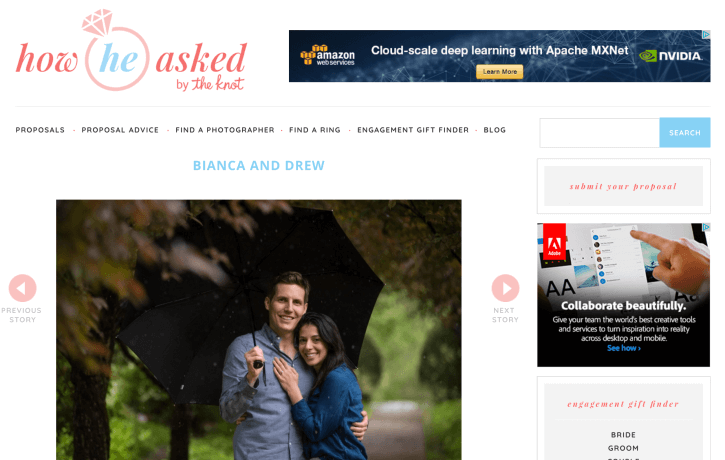 Mike B Photography was featured on How He Asked with his proposal shoot, Bianca and Drew. See the full feature here. Belladeux Event Design was featured on Honeybook with their guest article, Best Practices for Getting Organized in the Off-Season. See the full feature here. Taylor’d Events Group was featured on Honeybook with their guest article, Up and At ‘Em: How a productive morning translates to your workday. See the full feature here. Cocoon Events Management Group was featured on Honeybook with their guest article, How to Go Above and Beyond Your Clients’ Needs. See the full feature here. Cocoon Events Management Group was featured on Honeybook with their guest article, Incorporating “Surprise and Delight” into Your Events. See the full feature here. Cocoon Events Management Group was featured on Honeybook with their guest article, Planning a Successful Multi-Day Event. See the full feature here. Nahid’s Global Events was featured on Inside Weddings with their real wedding, Traditional Hindu Ceremony + White-Hued Reception in California. See the full feature here. OFD Consulting was featured on WeddingWire EDU with our guest blog, Wedding PR: How to Shine a Spotlight On Your Business. See the full feature here. Jenny DeMarco Photography was featured Modern Jewish Wedding with their real wedding, Romantic Modern Jewish Wedding in Austin, Texas. See the full feature here. Belladeux Event Design was featured on AllSeated with their guest article, Should You DIY or Hire a Designer? See the full feature here.